It’s really easy to make your own Loquat Jam and there are many Loquat Jam recipes out there, but this one has something extra; the vanilla bean. Jams are easy to make, I know people who anxiously wait every year for strawberry season so they can buy a flat of strawberries, then rush home to make jam. But wouldn’t it be nice to make a delicious jam from fruit that you can’t buy in most stores? Japanese Plums (commonly known as Loquats here in Australia) are a staple in many backyards. They’re also known as Japanese Medlars, Chinese Plums and knowns as pipa in China. A delicious fruit that many people don’t know what to do with. 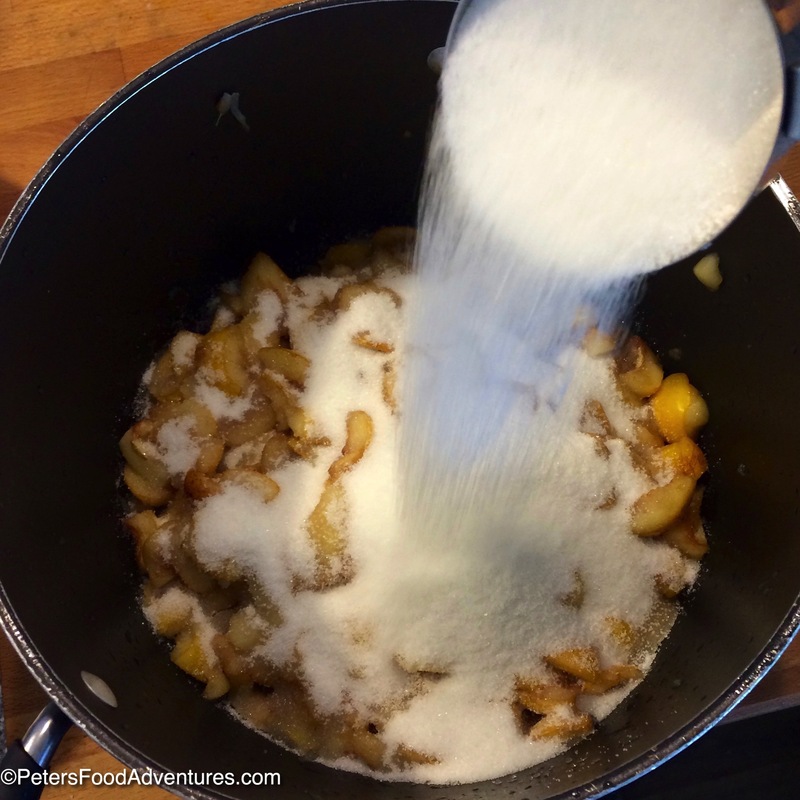 I also love making Loquat Apple Crumble. Loquats taste like a cross between several fruits, like peach, apricot, and apple. 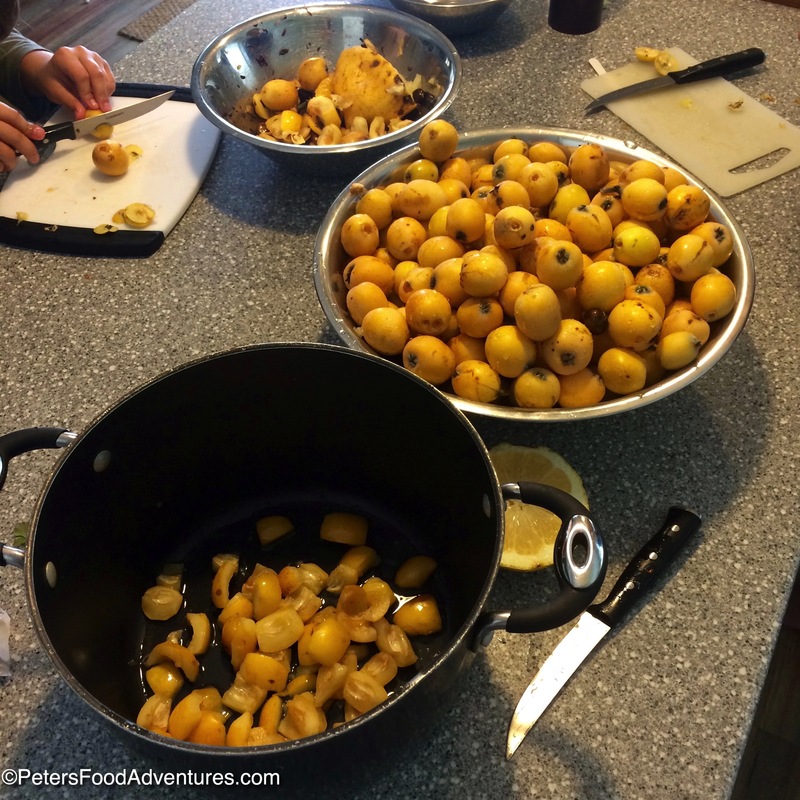 When you get a really ripe loquat, my son says it tastes sweet like honey. Japanese plums or loquats are closely related to the apple family, and have a slightly poisonous seed, like an apricot kernel. So don’t eat the seeds, although you would need to eat a large amount to get sick. Now I don’t like to fuss with a lot of things when cooking, such as peeling tiny fruits. Some people like to blanch them then peel them, but if they are ripe, they will peel easily. I don’t bother with all that fuss. 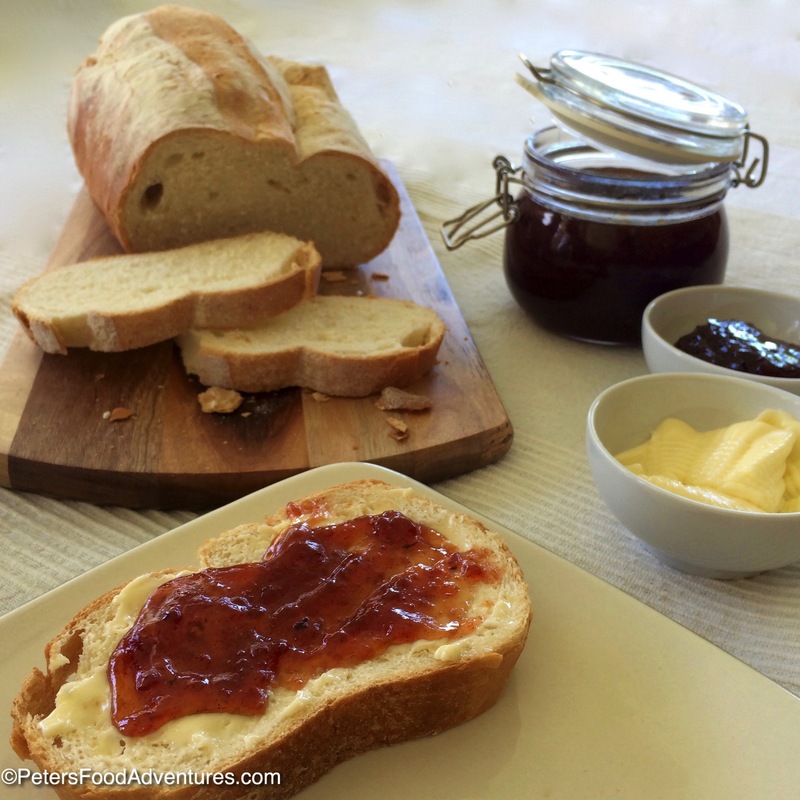 This loquat jam recipe is so easy. As the fruit cooks, it breaks down and softens the skin, then I use an immersion blender to blend it to a consistency I’m happy with. Loquats are high in fibre and high in pectin naturally, so you don’t need to add anything to your jam that shouldn’t belong. Plus it has the added bonus of being the only fruit ripening during winter/spring, when no other local fruit is available. 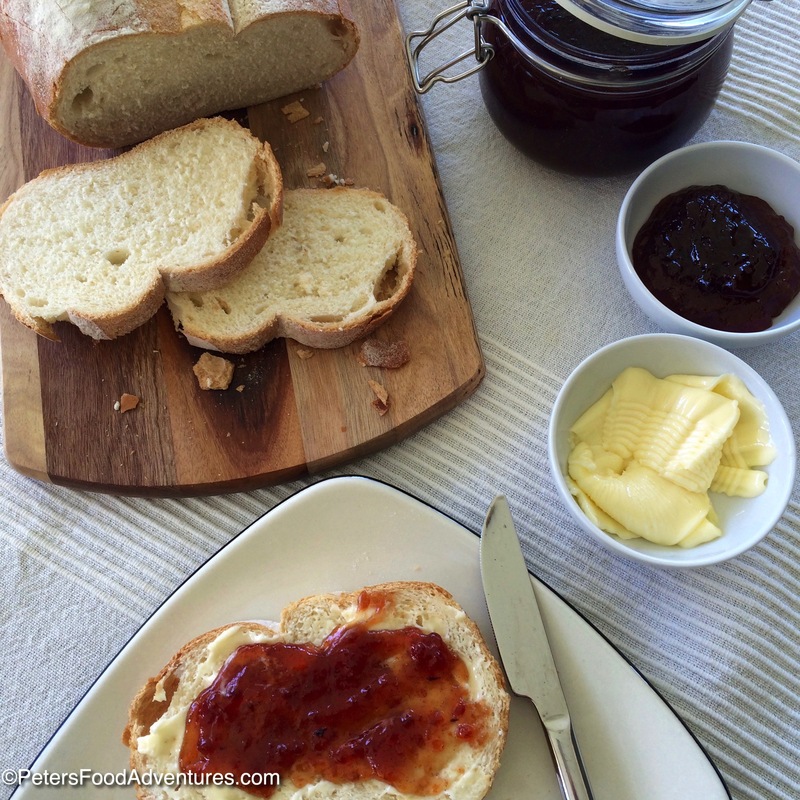 A Chinese Plum Jam recipe that’s easy, fresh and tasty, perfect for tomorrow’s breakfast. Bon Appetit! Приятного аппетита! Wash and de-seed loquats. Cut them into quarters. Add lemon juice to prevent them from browning (but also necessary for the jam to thicken). 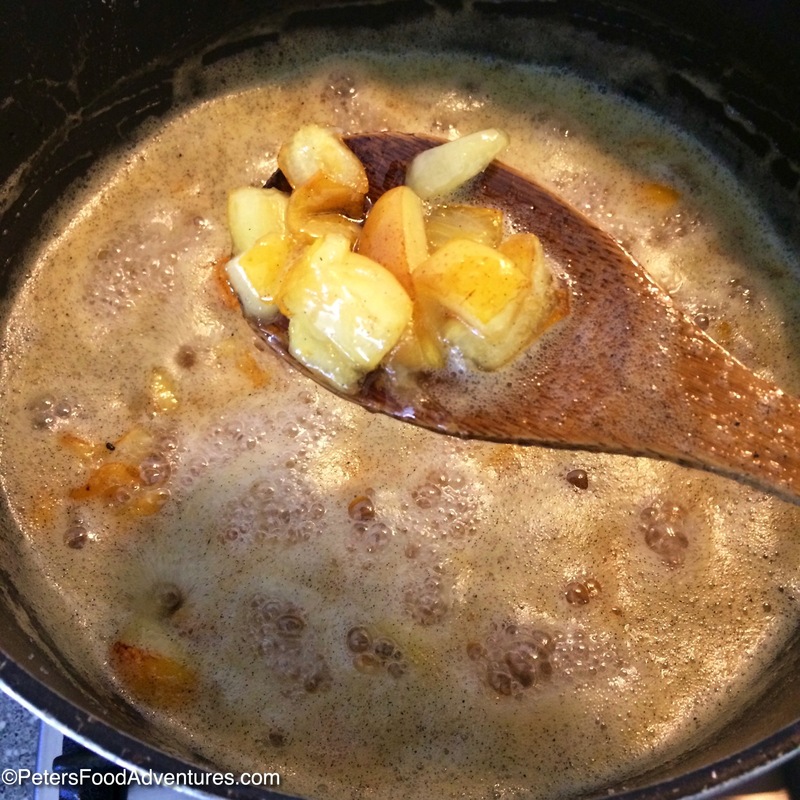 Put the loquats, sugar and lemon in a large pot over high heat, stirring until the sugar melts. 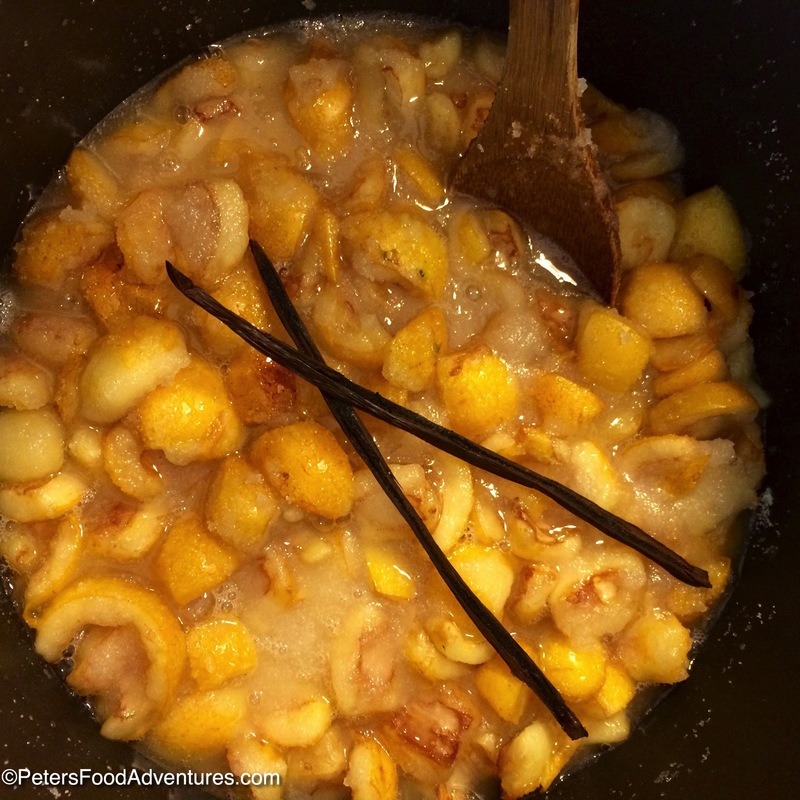 Cut the vanilla bean in half and add to the loquat mixture. Bring to a boil while stirring constantly, then reduce to a low simmer. Stir frequently to prevent from burning. The fruit will start to break down. You will need to cook this for approx 1 hour. At the 30 minute mark, remove the vanilla beans from the jam. Take a stick blender or immersion blender and blend the loquats. I like to leave some texture and lumps in my jam. 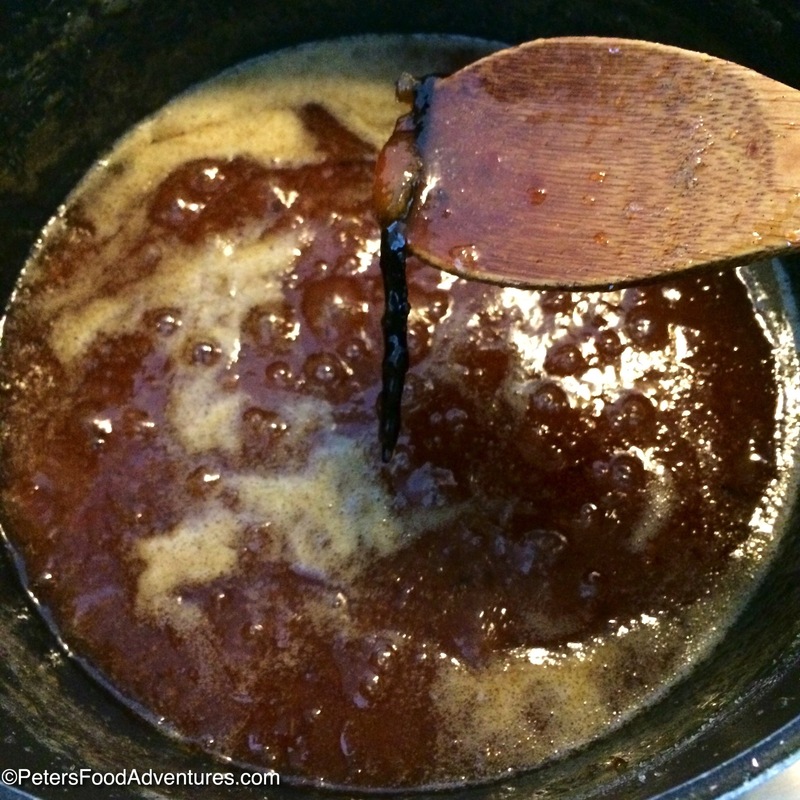 Add the vanilla beans again and continue to cook for the hour time frame, until the jam is thick. I find that after blending, the jam can burn quicker, so remember to stir. Ladle into jars and seal with a lid. Allow to cool and set. Keep refrigerated unless you have properly canned and sealed the jam. Enjoy. I wish I could give people samples online!!! 🙂 yum! But with good reason 🙂 lol! Looks yummy! Didn’t know it’s know as Japanese plum – ‘Biwa’ in Japanese. Now in the season over there? Very interesting cos here it’s June, before the rainy season + summer. I absolutely love homemade jams! And plum, yummy. Too bad we don’t have this variety here since plum is one of my favorites. I love opening a jar of jam in the winter and tasting a little of summer. Mine only lasts because I make so much! This summer it was most.y strawberry vanilla and several different blueberry jams. Sounds delicious, Peter! 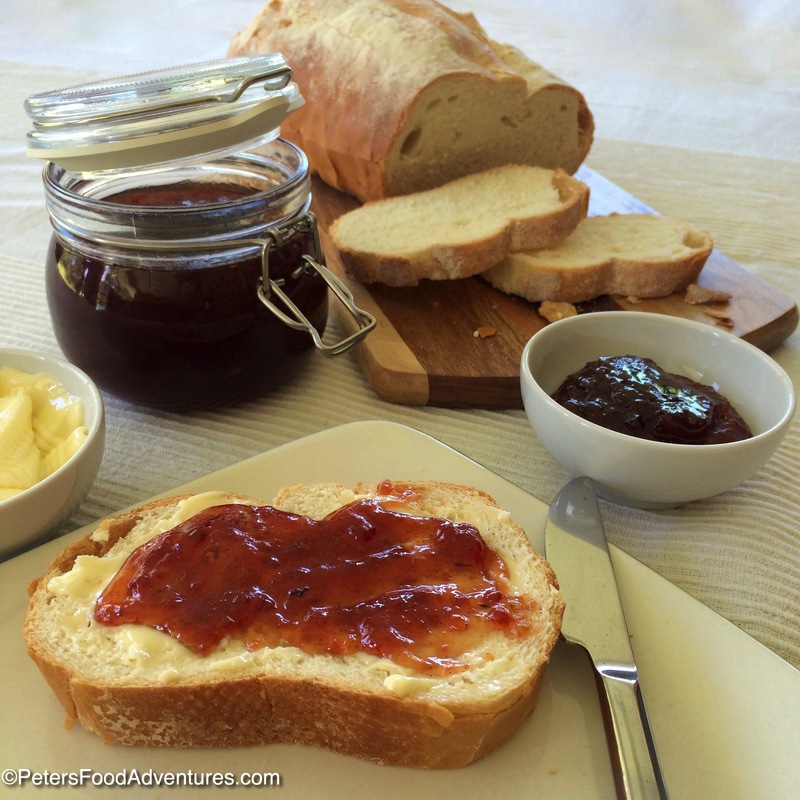 We just picked wild blackberries last month and made several posts of jam in Ireland. I know you can buy blackberry jam in the shops but I agree with you about it being wonderful to make it yourself. My youngest daughter and I called in two friends and we made it an afternoon occasion…such fun! Wish we could get Japanese Plums in our part of the world! My boys also did the picking and helping too! ???? It kinda reminds me of an apricot jam, but has a slight bitterness/tartness of a marmalade… hard to explain, but you are right, oh so good!!!! We call these Japanese Plums. The vanilla bean was a great addition, subtle, but definitely there. The flavours went great together. Thanks for a great recipe! I followed this recipe exactly, EXACTLY and once it was cooled in the fridge it literally turned into a solid brick of sugar, you can’t even chisel is out of the jar its so hard, I don’t know what went wrong, the only thing I can think to do know to try an salvage the jelly is to heat it up in the microwave just until I can pour it back in the pot and melt it down completely and add a lot of water and then pour it back into the jars. Any ideas? Ok, I’ll try that, thank you for the help. By the way…the jam tasted great until it fossilized! Thanks for the recipe, worked perfectly! I left out the vanilla bean, as it’s expensive, and it still tastes great! I love homemade jam! ???? I have two very large Japanese Plum trees in my yard and never knew what to do with all the fruit. Yesterday I saw this recipe and made the jam. I peeled all those tiny little fruits, took all day but I grow organic so the skins are pretty ugly. Anyway the results were amazing! 12 jelly jars full plus two bowls for immediate use. My neighbors will all get some. I still have loads of fruit on the trees but at least it hasn’t all gone to waste. Hey Jodi! That sounds amazing, and so generous of you to your neighbors too!! 👍🏻 Glad you enjoyed it! Thanks for the feedback, hope you enjoy it! Very tasty but too sweet to my liking, I’ll use less sugar next time. Note that there is a small woody end where the flower was that I cut off first and discard along with the seeds. Also, when I removed the seeds, there is a sack surrounding them that I scrape out with my fingernail. Otherwise, Thank you for the recipe as I love loquats and can’t bear seeing so much good fruit die and rot each year. Now I use so many more. I have a pressure cooker / canner. I would like to properly can them so that I don’t have to store in the refrigerator. How long should I can these at 15 lbs pressure?